Have your ever felt burdened by SMSF? Not every time! However, during the time of the year when your fund has to undergo an annual compliance and financial audit, the fees can be overwhelming and seem to pole-vault up your head! One of the biggest duties of the SMSF trustee is to get the fund audited at a minimal cost while ensuring high quality. Read this post to understand SMSF audit fees and 5 ways to keep it down. Why are the fees high? 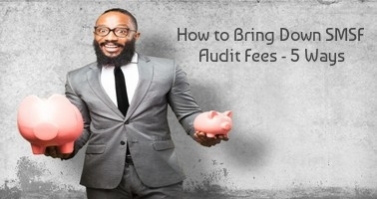 There are reasons why the SMSF Audit fees are sometimes very high.Right from the mandatory nature of these audits to the trustee carrying receipts in shoebox – there are various reasons why the SMSF audit fees vary. It varies from provider to provider as well and there lies the opportunity where a little groundwork of research could save you the extra dollars. The complexity of the super fund is a major driver for natural reasons. Add to that the number of members, number of investment strategies, number of transactions and the complexity of investments – this determines the audit overhead for the provider and is crucial in outlining the SMSF Audit Fees. The fee quote also depends on whether the super fund is in pension phase&whether the fund has members in both accumulation and pension phase. The super-tax accountants do charge higher in cases where the trust deed has been tailored for the specific needs of fund members. Tip: The Australian Securities and Investments Commission (ASIC) regulates approved SMSF auditors and can be reached if you’re concerned about the fees being charged. You would’ve seen this coming but appointing an experienced auditor could be the best way to address this. You might think you’re going to end up paying higher for the expert but the median fee structure that governs the super-tax accountants will come into play. So a little groundwork, like we said earlier, would help. An experienced auditor brings speed to the table and is well aware of the changing rules and regulations. They easily identify required corrections. One very big factor is the way in which items are presented for audit. Rather that throwing them all together, send documents to the auditor in a defined order so that the process can be easier and simpler for them.If the presenter follows a standard system of presenting data to the auditor, this saves time for the auditor which in turn brings down the fees considerably. If yours is not a DIY fund, it pays to educate your SMSF accountants on producing a better quality pre-audit file. Providing documents in order considerably saves the time of searching for missing documents. An easy to follow checklist has to be in place to make pulling together the right information. The checklist should cover all different variables that a trustee may choose to have in their fund. The list forms a handy reference to the presentation of list of items that were already prepared and make sure nothing is forgotten. The trustee should understand the sole purpose and ancillary purpose of the SMSF and manage the fund transactions accordingly. This facilitates the avoidance of any contravention in fund transactions and smooth audit as well using data analytics tools to automate audit testing.